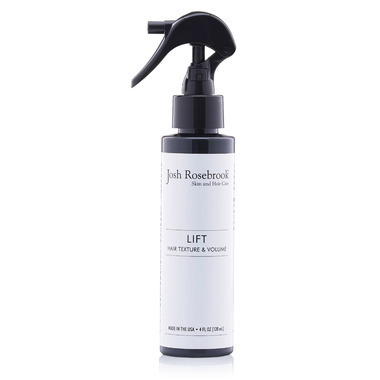 Josh Rosebrook Lift spray gives you weightless texture, volume and thickening with a matte, natural finish. It delivers effortless style and encourages a healthy scalp and strong hair growth through active herbal infusions. The herbal synergy of horsetail, lavender, sage, thyme, rosemary and peppermint work to gently stimulate the follicle and scalp, and nourish the bulb through increased circulation, which creates a stronger, thicker hair shaft; leaving you with fuller, healthier hair. Tips: For texture and thickening, spray on towel dried hair and disperse evenly using a comb or a brush. For maximum volume, apply at base of hair, comb through evenly, flip head over and blow dry base of hair upside down. After applying Lift, whether using a blow dryer or air drying, the product will dry to a crispy-like texture. Break up the product with hands or brush to create desired expansion and texture. I love this product. My hair is fine and wavy. It gives my hair volume and defines my curls. This stuff works! My hair is fine as straight and I have a hard time holding volume. This gives my roots a nice lift and holds all day. It does get sticky if you spray too much. Wish the bottle was bigger for the cost. I bought this because I wanted a toxin free hair product that would give my hair texture and volume however this product does nothing for my hair. It is crunchy and even after brushing it just seems dry with no change in texture, much like hair spray. It does give body to my very thin and flat hair. It tends to feel a bit stiff when it dries but if you brush your hair or use your hands to break it up, it softens quite well. I am pleasantly pleased with this product. If you lift your hair in sections and spray it works best. I love this product. It gives volume and smells good. The jet applicator is very convenient. Don't be surprised, it is a small format. Fantastic natural product , love that there's no chemicals but actually works - gives my hair tons of lift and defenition.